London Sport has made a commitment to ensuring the London has a Bigger and Better workforce behind the physical activity and sport taking place. We’ve made a clear commitment to understanding what inactive Londoners need from this workforce to help them feel supported to make the transition into being physically active as well as helping them grow in confidence, skill and health. Our forth coming strategy will address this area specifically. However, what about the existing workforce? those who are already actively supporting Londoners to be more active, to stay active and providing memorable experiences across London. Gone are the days where it was assumed that this hardy bunch of all-weather loving, whistle carrying sports enthusiasts were coaching for nothing more than the love of the game. 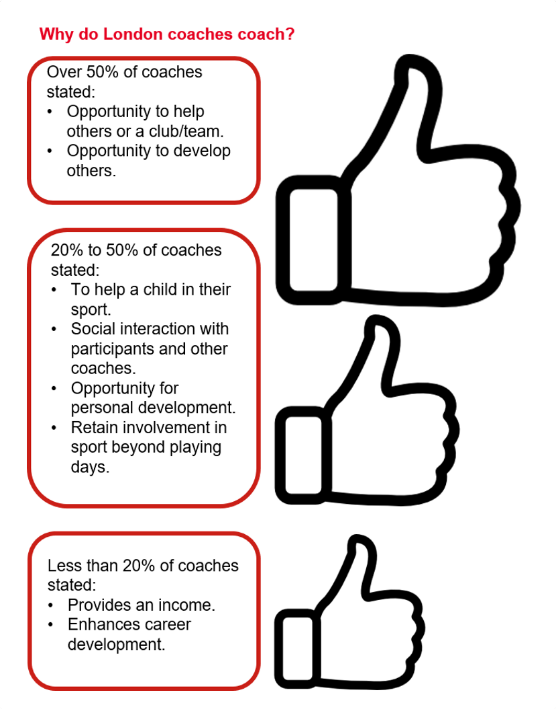 We know now that it’s just as important to understand the reasons why someone is coaching – the majority want to help others, be it a club, team, individual or their own child. 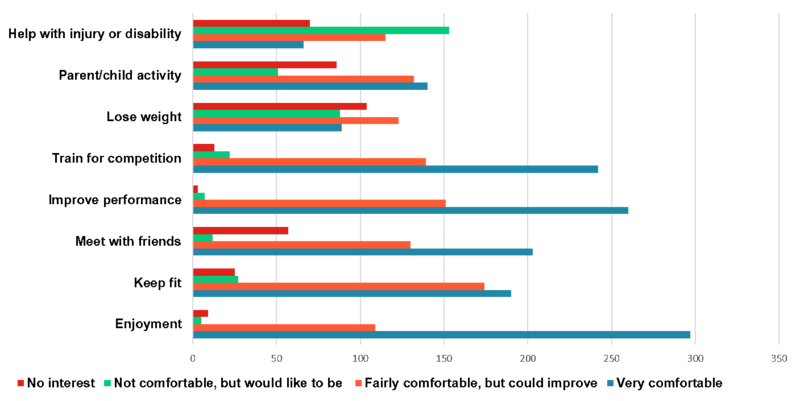 We also need to understand what type of session they like to coach, what groups they like to work with and when and where they want to coach. However, what if the coach leading the session doesn’t enjoy running a session aimed at training for competition? There’s a risk the participant won’t enjoy the session, but perhaps the greater risk is losing that coach from the workforce because they’re not fulfilled by their role. Most of London’s coaches are delivering around their job and giving up ‘free’ time, they want, and deserve, to enjoy how they fill that time. London’s existing workforce are far more comfortable delivering sessions for enjoyment, improving performance and training for competition and you might argue that is what has predominantly been asked for by participants, national governing bodies and clubs. They’re open to learning to lead better, more focused sessions for disabled participants, parent and child groups, and focused on motivations like weight loss which is an opening gambit for anyone looking to develop a meaningful training programme for their existing workforce. London’s coaches are as diverse as its participants, they span the generations, come from all walks of life, and bringing those experiences with them. However, just as with participation, there are clear inequalities, with low numbers of female coaches, disabled coaches and coaches from Black, Asian, and minority ethnic (BAME) backgrounds. This means that we have to look at what pathways are in place for these groups to access coaching, what barriers need to be addressed and what messages and support they need to start out in coaching. This is especially important as humans are hard-wired to feel comfortable in groups that reflect their own self-perceptions and in this context that means having coaches they can relate to; whether that’s a woman having a female coach, or a participant being coached by someone from the next street over. Excitingly, we know that not all our existing coaches are previous athletes, instead there’s a healthy flow into the role of coach from parents, students and via community links. With such vibrant coaches from communities across London we need to encourage their development, provide opportunity for them to coach more of who and what they enjoy and give them opportunity to share their knowledge and skills. Lorna Leach is a relationship manager with 12 years experience in the sector, her interests are workforce development, adult participation and the importance of learning from failure as a stepping stone to success.